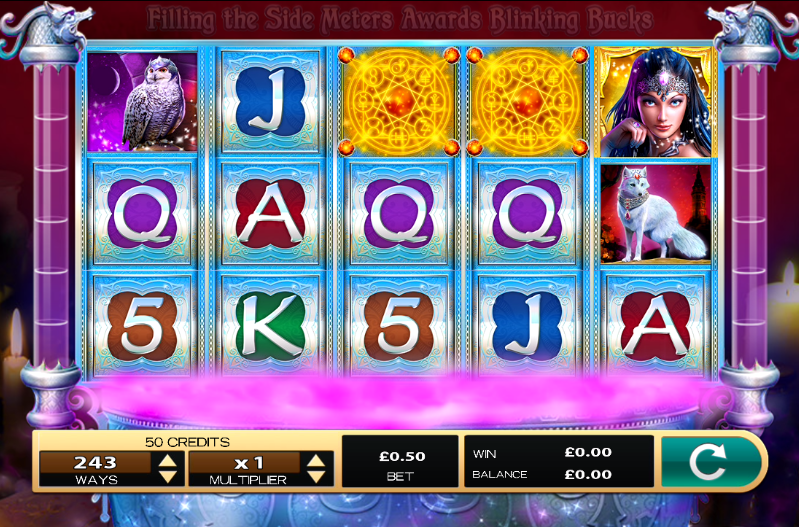 Silver Enchantress is an online casino slots game, centred on a theme of the adventures of a mysterious female magician, who is on a mission to brew the world’s ultimate potion. Assisted by her companion, a mysterious owl, she needs help from you to find the right ingredients for the potion, while the crescent moon sits high up in the sky. 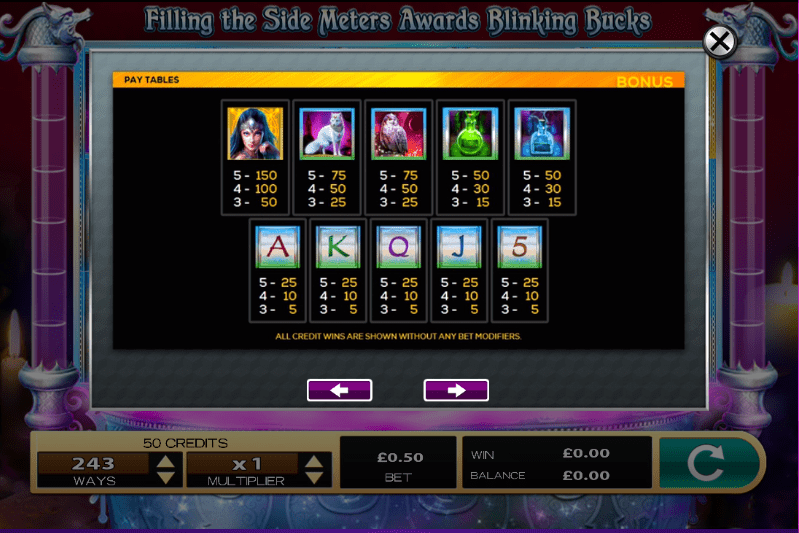 Developed by High 5 Games, Silver Enchantress is an appealing UK online slots game that should be popular with all fans of magic and mystery. The colour scheme of this game helps to create an atmosphere of feminine magic and mystery, with purple shades very much to the fore, along with blue and silver tones. A further sense of immersive mystery is provided by the eerie Theremin-inspired music. The actual gameplay is pretty standard, with three rows and five reels in operation. Features of the game include Blinking Bucks, Racking Up Riches and Jackpots. When winning combinations spin in, clouds of pixie dust appear, along with an explosion of lights and colour on the reels. The Blinking Bucks bonus offers you the chance to claim free games, extra credits, and you need to keep your eyes peeled for the Jackpot symbols. You can also pick up winnings worth five to 50 times your original bet. If you enter Blinking Bucks during the Jackpot round, that prize increases in size up to 4000 credits times the total bet. The game’s high to medium value symbols are the eponymous Enchantress, as well as her white wolf and owl companions, and green and blue potion bottles. The scatter symbol is a Wicca magic icon. If you are familiar with fruit machines, you should find this game very easy to understand. You can read more here. Founded in 1995, High 5 Games now has offices in over 50 countries and has a catalogue of over 300 games from which to choose. In 2011, it enjoyed massive success with two titles: Golden Goddess and Black Widow. These two games are among the most popular slots online games in history. In its 23-year history, the company has picked up a host of awards from the gaming industry, including the Electronic Gaming Review’s 2016 award for North America’s Best New Game. In 2012, the High 5 Casino was named as Facebook’s fastest growing virtual casino. They have created a number of innovative features in their games, including Tumbling Reels, Split Symbols and Super Stacks. Overall, Silver Enchantress offers some solid free online slot machine games with free spins fun, and it is well worth looking out for this game in your favourite online UK casino. The game has an engaging narrative, and its theme of mystery and magic will appeal to many potential players who like to lose themselves in a fantasy world while they play slots. With an average Return to Player rate of 96.8 percent, you can also find plenty of good value in playing this game.